If the taste of cod liver oil ranked equally as good as its claims of being good for you, would it make sense to consider the massive rise of testimonials by those who have plugged in to remarkable dental health – even the remineralization of cavities and naturally straight teeth? I assure you this is not a trendy wave of exaggerated claims. Ordinary folks are empowering dental health to occur in themselves and their children, sometimes seeing results within just a few months of taking this high powered oil. If you’re afraid of the taste, but you know your family should be taking cod liver oil, you really should give the Green Pasture flavored cod liver oils a try. Although we do get phone calls from people who don’t like it, the cinnamon tingle flavor is our most popular cod liver oil and our family’s favorite. 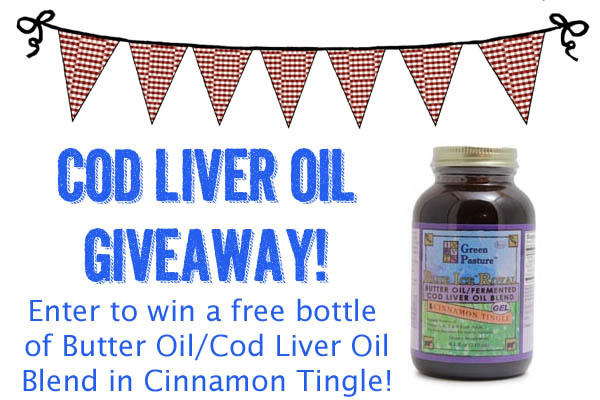 Whether you want to try it for the first time, or you’ve already experienced the benefits of cod liver oil for yourself, enter to win one of several bottles of Green Pasture’s Cinnamon Tingle Butter Oil/ Fermented Cod Liver Oil Blend – our most popular flavor! Post a comment below, telling us how cod liver oil has benefited your family, why you already use it, or why you want to try it. Order anything from our March order form. Anything you like, small or large. Everything you see on the order form is available to order. Just click the item, and it will open up a quantity menu if it doesn’t already have one. Order here if you want to pick up your order locally, from any of 50 locations across Tennessee and into the surrounding states. Order here if you’d like to have your order shipped to your door. If you win, your free bottle of cod liver oil will be included when your order ships or when you pick it up locally, depending on which order form you chose. How’s that for a great way to try something new?